Imagine it, a massive solar flare blasts out from the sun causing an electromagnetic storm that fries the grid and any electronics along with it. All Un-shielded digital information, late model vehicles, and communications down for good. Even systems and machinery that rely on basic circuitry would be rendered inoperable by such an event. How long does it take to rebuild a power plant? To rewire an entire electrical grid? How does society react and adjust? In any massive disaster scenario the variables are almost to numerous to consider. The only sure preparation for these types of scenarios, is the acquisition of skills and knowledge that will keep your world turning. The “Primitive” skills related below are primitive in relation to modern technology, not as far back the stone age. 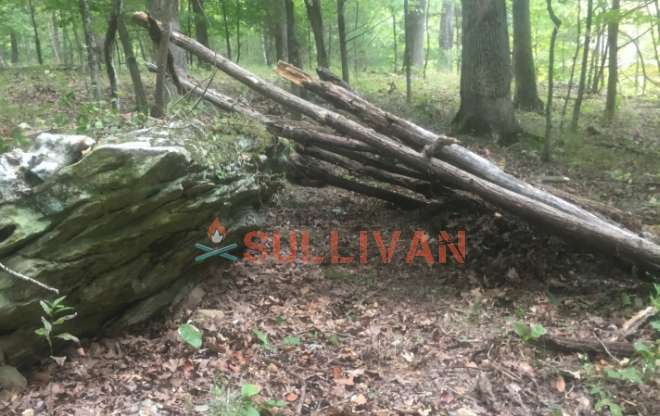 Whether for disaster or collapse survival, or simply to reconnect with your roots, you should have a grasp on these skills that were once necessities. For cooking, warmth, and lighting fire is needed. You’ll want a few ways to make flame without access to matches or a lighter. Knowledge of alternative methods such as flint and steel or using a lens are good, but knowing a few friction methods as well will round out this category . Sparking a flame is not the only factor in having a good fire, you need fuel for it also. Finding good tinder, or knowing how to improvise it will accelerate the process.When making a fire, finding the right kindling gets you started, but finding dry, dense logs will keep your fire going through the night. Look for dead and down trees and branches, anything still growing will be wet and burn heavy with smoke. Hunting, fishing, and foraging are skills that were absolutely essential to our distant ancestors. Whether with a bow and arrow, sling, spear, gun, or anything else, hunting has been part of the human experience for over 100,000 years. To take down big game or small, there is a significant amount of knowledge and practice involved in the process, which is why you may want to consider making your own archery target to practice. You’ll want to know where to find game, what it eats, and how to track it. Hunting is more than simply killing an animal and eating it. A good hunter kills his prey with mercy, and respects it as a source of food. Becoming adept at hunting can take years in some cases. Fishing can be so much more than using a fishing pole. Cast-net fishing, fish trapping, and spearfishing are just a few other alternatives to this. Foraging will be slightly different depending on your location. Knowing what vegetation is available in your area, or better yet a few areas, and how to identify them is a skill that can keep you from starving. Herbs, spices, and other goodies you find can also turn a bland dinner into a delicious one. This may seem like a no brainer, but you’d be surprised how many people lack this skill. Knowing how to cook is not merely understanding how long to keep food over fire, it means understanding how to prepare food that is nutritional and satisfying. Cooking with open flame is much different then your standard oven or stovetop. The spit roast will likely be your go to method for roasting game over an open fire. Having a dutch oven or solid clay pot will do wonders for your ability to make good food without a proper kitchen. Knowing how to use roast, bake, make soups, and just get the most out of your available ingredients is essential when supplies are scarce. Good video on improvising your own clay cooker. Agriculture and cultivation of livestock are what allowed our ancestors to move from being hunter-gatherers to having cities. Moderate gardening skills can turn even a small amount of land into a harvest that can feed you and your family through the seasons. Gardening is a skill, and agriculture requires a bit of knowledge and some care. Cattle, sheep, chickens, goats, pigs, even fish can be farmed and maintained to provide you with not only a protein source, but several byproducts as well. Leather, wool, and milk can come from your farmed animals, and the water from farmed fish can be used to water your garden. Before refrigerators, freezers, packaged goods, and all that people were able to store their excess food for emergencies or hard times. Knowing how to cure and smoke meats, dry vegetables, and preserve and can other food supplies is another way to keep the worry of hunger at bay. Included is the processing and butchering of any game and livestock, as well as the best times to harvest your crop and preserve seeds for the next year. If you were had no other options, could you construct a passable shelter from your surroundings? Knowing how to protect yourself from the elements when necessary is essential to survival, in any scenario. Learn a few concepts, and then practice actually applying them on an outing just to gauge your success. This may seem as easy as putting one foot in front of the other, but most people are used to walking up and down steps, and getting to and from their destinations on paved ground. Trekking into the wild, especially long distances, with gear and supplies is indeed a skill in itself. Aside from the physical activity itself, identifying trails, traversing various terrain, and even deciding where to camp are all skills. For those who have spent most of their time indoors, hiking 5 miles through the hills in a day can seem like an insurmountable task. Know how to read a map and be able to find a path without a trail. Learn to use a compass, and be able to maneuver and plot routes with it. A compass is fairly easy to come by nowadays, but knowing how to use the stars and sun to get your bearings is a good idea also. Standard Wilderness First Aid is a good start, and it also doesn’t hurt to have some knowledge of a few natural remedies, along with some medicinal herbs. There are plenty of things out there that got us by prior to modern medicine. Know how to clean and suture wounds, prevent infections, and even set broken bones. Preventing and treating infection, cold remedies, digestive remedies, and even pain relief can be accomplished with the right herbal remedies and knowledge. A good balance of modern medicine and homeopathic remedies will keep you safe and able to fend for yourself if necessary. Today we throw away more than we keep it seems like. In times of scarcity, our ancestors used and re-used things as often and in as many ways as they could. Know how to repair or re-engineer your broken or damaged gear, as well as salvage what you might find along the way. In the event of a societal meltdown, there will still be plenty of our junk lying around for the taking. Sewing an old piece of tarp on to stitch up a damaged backpack. I mean to say running, not jogging. There may be times when escape is your best option, even in our current day and age. If you do need to flee danger, you don’t want to roll your ankle or blow out your knees because you haven’t prepared or run in years. Start of with light jogging, but understand what it will take to break into a full sprint , just in case you ever need to. Another age old skill is knowing how to hide. Much of humankind’s history has been dangerous, so knowing how to stay out of sight came in handy. Knowing how to hide involves more than just being out of direct line of sight, and a good hiding spot could keep you safe when you need it most. Ideally,whether in the wilderness or not, your hiding place will have more than one entrance so you can make a break for it if you need to. This is as primitive as it gets. Knowing how to fight does not necessarily mean knowing some kind of martial art, it simply means knowing, and being willing to use physical violence to protect yourself or those you care about. For those who have never experienced an actual physical confrontation or contact sports, the experience is often jarring and unexpected. At the very least hitting a punching bag a few times to get the physics down would be a good idea. While I am a big fan of martial arts training, there are plenty of videos like the one below that give you pointers on fighting. Before TV, cell phones, cable, radio, and Facebook, people still had to keep themselves entertained. Learn how to live a life unplugged from the digital world, and find joys in life that don’t depend on modern technology and electronics. Enjoy a campfire, look at the stars, be a human. Clubs, spoons, mortar and pestle, bows, arrows, hoko knives, wooden spoons and many, many more can be made with only a good knife. Sure, in order to make something of quality, you’ll need more than that but, nevertheless, “primitive woodworking” is a great skill to learn. ‘Primitive skills’ are not to be viewed simply as a remedy for the “apocalypse”, but should be seen as a testaments to our own self reliance. Having these skills, and passing them on to future generations is humanity’s insurance policy. It’s how we can ensure that people will not only be able to survive, but they will continue to have a working relationship with the planet that we inhabit. You might want to consider adding ‘making cordage’ to your list.